Cut out a bunch of small foam circles. 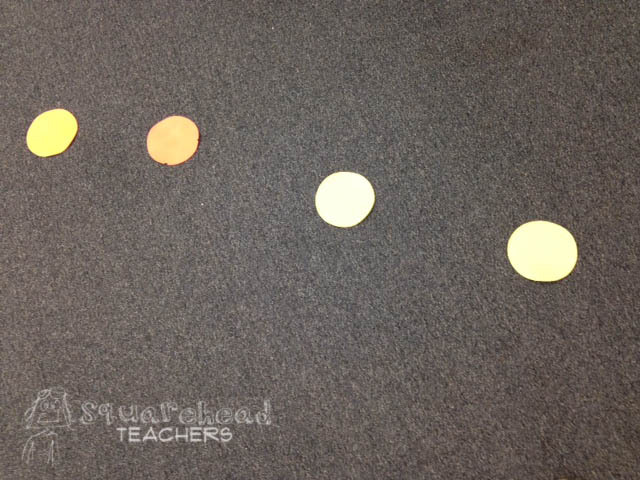 Then as you’re giving directions, drop them on the ground in a spread out circle so students know where to sit. This is an idea that many PE teachers use (but they use those dinner plate sized rubber circles that are pretty pricey). This idea takes the genius of that concept and adapts it to an economical, storage-friendly solution. Just be sure to have kids return the foam circles when you’re done with the activity (or maybe right after they sit down, so they don’t become a distraction). Have a good idea to share? Send it to me (squareheadteachers at gmail dot com) so other teachers can benefit also! Thank ya much! This entry was posted in Beginning of the Year, Management and tagged Children, classroom, Education, Elementary School, Homeschool, Kids, sit, students, Teacher Resources, Teachers, Teaching by Squarehead Teachers. Bookmark the permalink.